Digital ad spending outstripped TV in 2016, mostly because of mobile. Why has digital advertising grown so much? And what does this mean for marketers? A small but momentous moment happened in marketing last year. Digital advertising spend outstripped TV advertising spend in the US for the very first time. PwC projects $75.3bn will be spent on digital, compared to $70.4bn on TV. This is principally due to the explosion in mobile advertising. Mobile ad spend increased 89% in the first half of 2016, to make up 47% of digital advertising; a total of $15.5bn, the largest single segment. This is a watermark moment. The tipping point where traditional advertising – print, TV and radio – officially plays second fiddle to digital. The writing’s on the wall. If you want to get the word out, mobile is the way to go. The fundamental change is in how we consume media. It’s well known by now that younger Millennials – Generation Z in particular – barely touch traditional television. A glimpse at YouTube’s Year in Review – and the instant recognition that those older than 25 have no idea who any of these celebrities are – is enough to tell you they inhabit a different cultural sphere. TV viewing declined globally by 13% in 2016. 14-17 year olds fled the box at a rate of 33%, 18-34 year olds by 14% and 35-54 year olds by 11%. Smartphone use has penetrated every demographic, but none so much as the young; who are more inclined to watch on-demand with a laptop, phone or tablet even when watching old fashioned scripted television. Even then, mobile far outstrips every other sector of digital advertising, including banner ads and search, and is still on the ascendency. Facebook reported 84% of its advertising revenue came from mobile in the first half of 2016. There are other reasons why marketers prefer digital advertising to analogue: measurability and cost. In digital, everything is measurable. You can measure clicks, views, territory – the metrics are as long as your attention span – and you can follow users right through until conversion to get a definite, quantitative ROI. No guesswork here. You can also control spend far more easily. Hidden in the billions of dollars spent on digital are innumerable sole traders and small companies who simply can’t afford TV or print ads. But they can afford AdWords and Facebook stories. 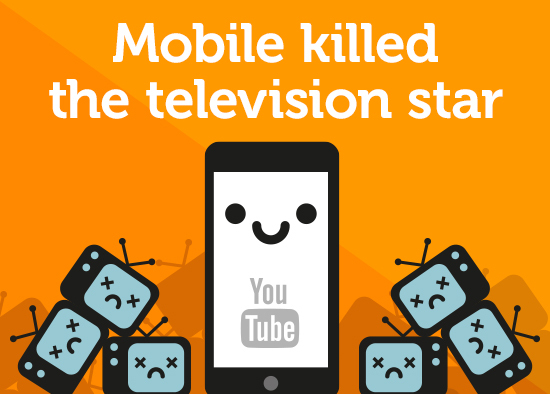 It’s worth bearing in mind that while the enormous growth in mobile spend is down to marketers following their audience, that digital outstrips TV is as much to do with who’s buying the ad space as who’s watching. But these are just more reasons to embrace it. Of course, the final reason digital ad spend has grown so enormously is because the gatekeepers of the internet have made it so. Taken together, Google and Facebook account for 85% of digital advertising spend. 97% of Facebook’s revenue comes from adverts. Nearly 90% of Google’s. And they have both done everything they can to clamp down on free promotion via their platforms. Meanwhile, Facebook has done the same with its EdgeRank algorithm to make organic posts from promotional pages virtually worthless. Over the years, fewer and fewer Facebook fans actually see anything posted by a page organically. This means businesses aiming to use search and social for promotion – and you should, because that’s where your audience is – have to cough up cold, hard cash. The virtual monopoly enjoyed by Google and Facebook means there are very few alternatives. OK, so that’s the trend. What’s the practical day-to-day impact for marketers trying to get raise brand awareness? It means it’s time to start engaging seriously with mobile advertising, and that means engaging seriously with content marketing. On social, the mobile ad format of choice is the native advert or ‘sponsored story’. Those little paid-for statuses that appear in your Facebook feed. With no sidebar to separate adverts and content, the ad masquerading as content is the only option. On search, it means creating adverts specifically optimised for mobile. Ideally taking advantage of images, video and HTML 5 to really stand out on a small screen. Text ads only take a second to swipe away from. You need to advertise on mobile for the same reason everyone else does, but because everyone else is already doing it, you need to find a way to stand out. And that, as ever, comes down to money, creativity, or both.